The material presented here summarises the growth of the Welwyn Garden City shopping centre from its earliest days to the present day (2010). 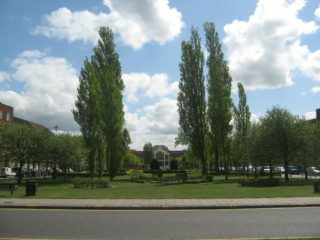 Welwyn Garden City is the second Garden City in the UK established by Ebenezer Howard, the first homes appearing around 1920. In the early days, the principle and only shop available was the Welwyn Stores which was established to provide most things the early residents would require. There were also a few other establishments such as banks which operated from small temporary buildings around what we now know as The Campus. By the late 30s, the number and variety of shops had increased significantly though by then the new Welwyn Department Store dominated. There was little significant change during and after World War II until well into the late 50s/early 60s. By the early 90s, the Howard Centre was complete which dramatically changed shopping in the town. My favourite shop of all was H A Blunt & Sons, or “The Model Shop” as we used to call it. It was an Aladdin’s Cave if you were interested in such things, and it was a sad day when it closed, although it saved me a fortune in pocket money. Another favourite was Pond Tools, an interior that I’m always reminded of when I watch The Two Ronnies “Fork Handles” sketch! !